What a wonderful innkeeper you are! Growing up, hospitality was taught by knowing that the ‘good’ sheets and newest towels were ‘saved’ for guests. The pretty soap in the shape of roses was ‘saved’ for them also. It was grandma baking in the kitchen and dad making sure the outside of the house looked nice. It was waking up as an 8yr old to 20 college kids sleeping all over my house. Now I am blessed having a house that everyone drops into also, be it the backdoor neighbor next door or the college boys coming with friends for visits. i love the art of dropping in. another sumptuous brand of company. and i crack up at the notion of saving. i too find myself “saving” the good stuff. i have to remind myself to USE it, before the darn expiration dates roll around. or, in the case of all my lovely “saved” soaps, the hungry mice beat me to it, and gobbled it all up. so much for saving it for company. which, i suppose, i did. long-tailed company, indeed…. I don’t have much room to entertain in my itty-bitty apartment, but I love opening my “home” to my friends for dinner, book club, or an overnight stay. As an introvert, I cherish my personal space, so it feels like I am sharing something essential about myself by welcoming friends into my abode — talking with them, cooking for them, letting them peruse the books on my bookshelf. Although I’m sure there are many more apartments and adventures in my near future, I look forward to the day when I have a whole house to decorate and call my own so that I can share it with the people I love. hmm, there must be something about introverts and treasuring our space. i suddenly picture a snail inside her house, that would be me. carrying it around on my back. and perhaps why it means so much to open my rooms to the people i treasure. Ah, French knots did you say? In high school, I did a “summer home stay” with a family in France, and they taught me, besides how to make mayonnaise and the joy of creme fraiche, that the best way to make a visitor feel at home is to treat them like they live in your home. They became my “fraude famille” (and “fraude” is so much nicer in French than “fraud” is in English). So I continue the tradition: if you come to visit, I’ll “let” you set the table, make your bed, sweep the floor, set up the folding chairs for the big dinner. You wash, I’ll dry–I know where to put the glasses away so they fit. B&B? 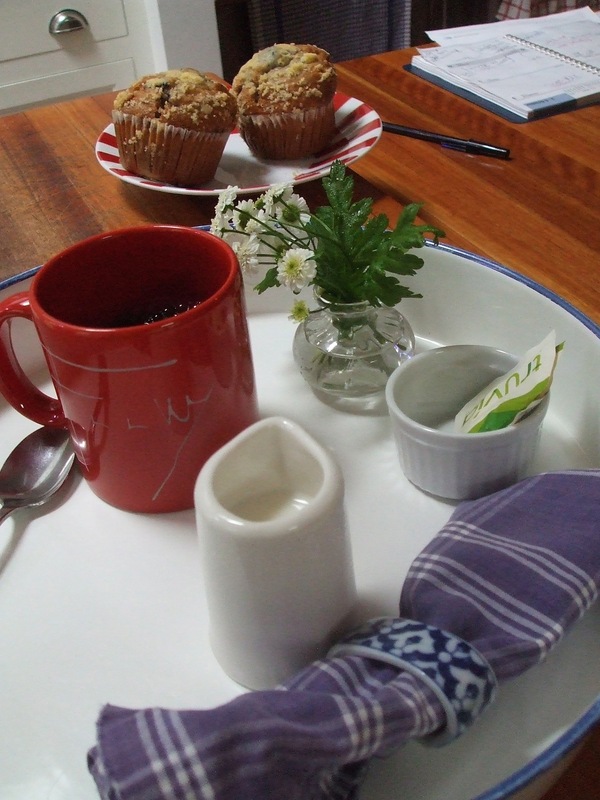 In this B&B, you might have to make your own cranberry muffins. But my DH will make the coffee. dear notherbarb, i love that notion. i love the “fraude,” but i love more the making the person feel part of the fabric. i learned from my husband’s family the art of giving everyone plenty of breathing room in a visit: my house is your house; curl up in a nook if you please; close the bedroom door and savor quiet time at the end of a long day; tiptoe down for midnight snacks and no one will raise an eyebrow. i love your extension of that, and truly making someone feel home.